Till now you have got a lot about basic SEO checklist you could do on your own to optimize your blog to improve traffic to website. To keep receiving the targeted traffic you always tend for writing SEO optimized article that will help you rank higher in search results. But in case you want to drive massive traffic but quality & targeted audience for your website, not only SEO setup checklist is important but content promotion checklist is also required to make sure you have followed all the things once you published a new blog post or article on your website. The fact is once you published your post, you and your RSS subscribers are the ONLY people who get known about your new post quickly. Clearly, I made SEO and blogging out to be much harder than what it is. We know growing a blog takes time - but making awareness about your blog help to grow your blog in an online market. It's now easy to publish articles online but most of the content writers failed to grow and drive traffic to the new post. There are lots of long discussions on what to do after you publish a blog post, but this article going to tell you quick 5 things you need to do AFTER publishing a new post. These are the top 5 quick marketing steps to take immediately after you publish a new article. Bookmark this page as a Blog Post Checklist - you should do to every blog post after you hit PUBLISH. This blog post checklist helps you make your own blog site viral in social media. 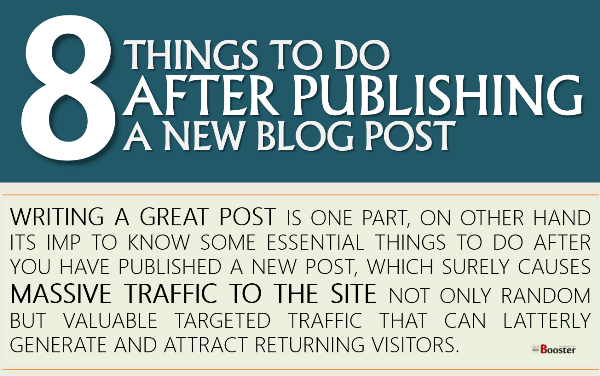 Last time you have seen most important; 15 Things To Do BEFORE Publishing A New Blog Post. But once you finished with these things and after writing a proper blog post, you now then become excited to share your blog post with your existing followers and subscribers you connected. This article will work as a free online task management and help you to publish articles online. Writing a great post is one part, on other hand its IMP to know some essential things to do after publishing a new post, which surely drive more organic traffic to the site; not only random but valuable targeted traffic that can latterly generate and attract returning visitors. 1. Re-Optimize high paying CPC keywords. Read again your whole post and find the exact topic-keyword which describes the content of your post. 2. Ping it & share on bookmarking & Sites. First, shorten the post-URL. Sites like Digg, Mix(StumbleUpon), etc are really traffic grabber for a selected topic-keyword. Ping your URL on it. Then to grab public quickly on your post you need to share it on social sites like FB, Twitter, etc. 3. Find related topic & Comment. Now you need to find other posts related to your topic and then comment on them; just to develop relationships which further causes more organic traffic. 4. Check social market & specific target sharing. Now you need to significantly find the specific readers about the topic. Like if you are talking about Photoshop then you need to let some widely used Photoshop users know about your content and tutorial which they can come to see & talk, which further causes more sharing. 5. Inform & Ask other. Inform your readers about new tutorial meanwhile, ask other bloggers or writers to recommend your post and to write a blog about or link to your topic. This can be a good way to build healthy backlinks. It's important to schedule your pages for future traffic flow. You must start scheduling your new page for social sharing to be shared throughout the month. 7. Build interaction & engagement. Once you published, readers are started to get your page read. Try to reply to all the comments and queries you received on your page. It’s absolutely important that you answer all of them. It will improve your blog engagement and also increase page views. The Google Alerts allows you to set up the email alerts for the targetted keywords within your blog post. Set the Google alert and it will remind you once the page is get indexed and when it goes viral. Earning traffic is not rocket science, but these steps are much easier to follow for anyone to generate valuable visitors.